Palestine remains in a state of heightened political uncertainty, which has a significant impact on the development of the Palestinian economy and the employment of Palestinian workers. 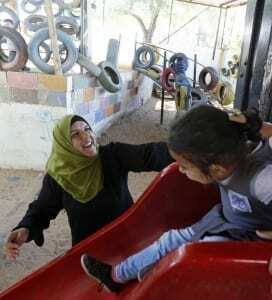 Palestine workers like Khadeja, a kindergarten teacher, find strength in their union. See more. Palestinian political representation continues to be split both geographically and politically between the West Bank and Gaza Strip. Attempts at a Palestinian national dialogue have failed to bring unity between the two political parties, Fatah and Hamas, despite support for reconciliation among the population. Looming questions remain about future Palestinian elections and the formation of a unity government, the likelihood of achieving statehood and the resolution of the conflict with Israel. More than 600 Israeli checkpoints and road obstructions, as well as frequent road closures, severely restrict freedom of movement, commerce and employment. In this stressed and changing environment, providing support for civil society is imperative. 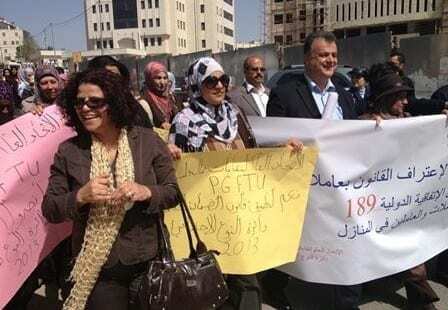 As the principal voice for working families and the unemployed, the Palestinian General Federation of Trade Unions (PGFTU) plays a prominent role in backing the rule of law and developing coalitions among organizations seeking peaceful solutions to the conflict. Despite severe challenges, the PGFTU remains an important voice for working families and for the growing numbers of jobless workers. As membership-based, civil society organizations, unions are grounded in the daily life of thousands of working people. Trade unions are among the most significant institutions of civil society not directly tied to any political party. The Solidarity Center works with PGFTU in its advocacy for sustainable job creation and labor law enforcement, and its efforts to improve the lives of working people and create a more equitable society. Additional Solidarity Center initiatives help the PGFTU build national unions, organize workers into trade unions, train newly elected union officers and advocate for national policies aimed at creating decent jobs.